Download "SOUTHWEST TRAINING INSTITUTE--SINCE 1988 Personal Learning Instruments, Assessments, Inventories, Profiles, & Feedback Reports"
3 6D. Job-Talent Fit Comparison identify potential talent for the job out of all the candidates. It is easy to do this using our Talent Fit report. In only a few minutes, job candidates can enter responses to the Talent Fit questionnaire. The resulting Talent Fit report shows the candidates exact behavioral styles, values, and preferred work tasks which are represented in graphs identical to the graphs in the Job Fit benchmark. Comparing the job benchmark to talent reports will reveal which candidates match the job s essential behavioral styles, values, and required tasks. The comparison provides important selection input, together with skill tests, reference checks, background checks, behavioral interviewing results, and other considerations appropriate to the hiring decision. The right talent in the right job equals top performance and employee satisfaction, which is exactly what every company wants! After completing the job benchmark with Job Fit, and defining talent with Talent Fit, you can compare and match the job's required behaviors and rewards/culture to a candidate's ideal behaviors and motivators. You have produced a valuable piece of the information you need to make the best decisions on hiring top talent. Allows up to 5 Talent Fit s to be compared to the Job Benchmarked through Job Fit. 6E. Coaching The Coaching was designed to increase the understanding of an individual's talents. The report provides insight into two distinct areas: behaviors and motivators. Understanding strengths and weaknesses in both of these areas will lead to personal and professional development and a higher level of satisfaction. Useful for new-hire coaching and development. 7. How to Interview the REAL Person (General) 8. How to Interview the REAL Person (Sales) 9. Understanding Behavioral Styles This feedback has selection validity for selecting the right person for the job. This special program allows you to compare the person you are interviewing to their personal feedback. It eliminates the candidate from masking behavior just to get the job. Make sure you hire the real person not their adapted behavior for the interview. 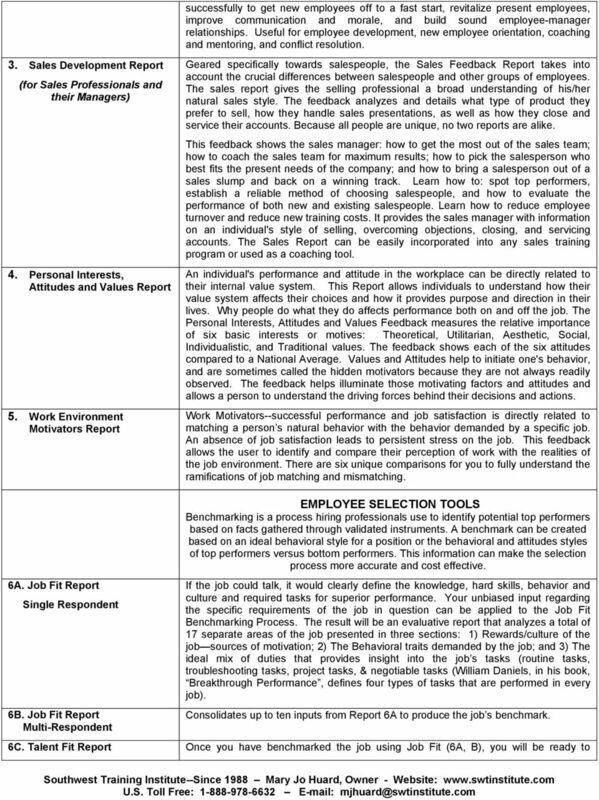 This feedback has selection validity for selecting the right person for the job. This special program allows you to compare the person you are interviewing to their personal feedback. It eliminates the candidate from masking behavior just to get the job. Make sure you hire the real person not their adapted behavior for the interview. 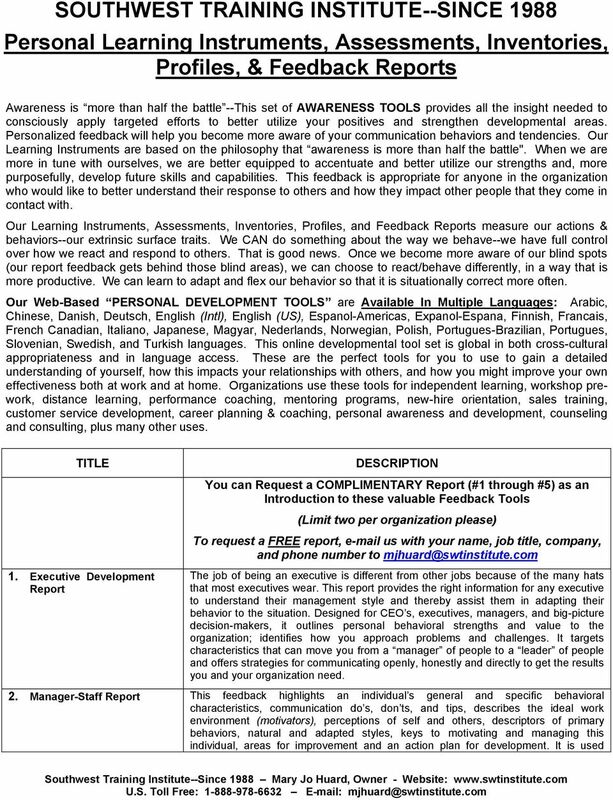 INDIVIDUAL-TEAM DEVELOPMENT REPORTS Help your employees understand how their thoughts and their feelings drive behavior, and how to manage emotions to achieve desired work and relationship results. This feedback helps to understand your emotions, thoughts, and behavior in changing situations. You will learn how to manage your emotions, improve communication, reduce conflict, and value other points of view. This feedback will help to create adaptive, flexible employees. It will encourage your employees to take responsibility navigating the lifelong journey of self-discovery. Use to improve communication, foster teamwork, reduce conflict, and manage stress. 10. Coping & Stress Profile Learners gain insight into various stress areas (work, personal, family, relationship, etc.) and the coping resources that are available to help. 11. Personal Listening Styles Profile Identify your natural listening approach and use other approaches depending on the situation. Participants will learn five listening approaches and how to become active, purposeful listeners in a wide variety of situations for both sending and receiving accurate messages. 12. 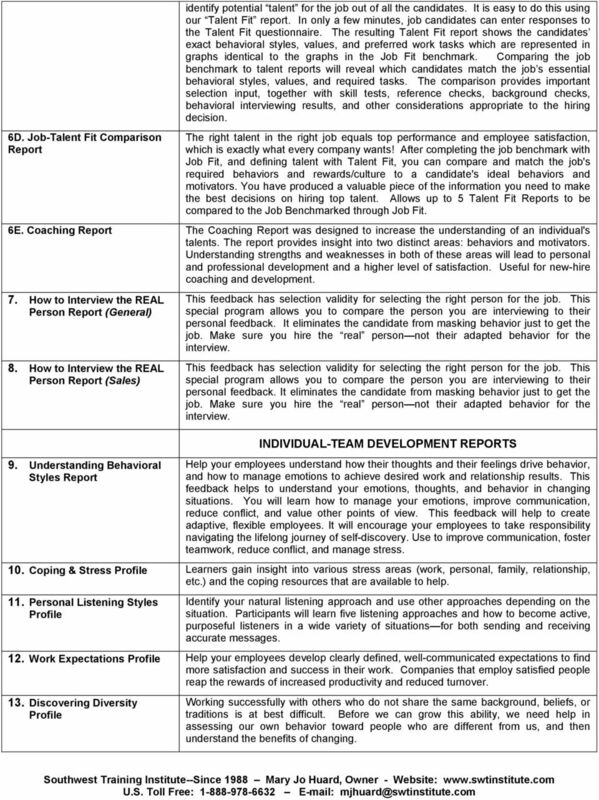 Work Expectations Profile Help your employees develop clearly defined, well-communicated expectations to find more satisfaction and success in their work. Companies that employ satisfied people reap the rewards of increased productivity and reduced turnover. 13. Discovering Diversity Profile Working successfully with others who do not share the same background, beliefs, or traditions is at best difficult. Before we can grow this ability, we need help in assessing our own behavior toward people who are different from us, and then understand the benefits of changing. 7 40. Understanding Behavior 41. Behavioral Supplemental s (6 parts) they do. Learn the skill of adapting the needs of others so become more situationally appropriate more often. Help your employees understand how their thoughts and their feelings drive behavior, and how to manage emotions to achieve desired work and relationship results. This feedback helps to understand your emotions, thoughts, and behavior in changing situations. You will learn how to manage your emotions, improve communication, reduce conflict, and value other points of view. This feedback will help to create adaptive, flexible employees. It will encourage your employees to take responsibility navigating the lifelong journey of self-discovery. use to improve communication, foster teamwork, reduce conflict, and manage stress. Characteristics report gives valuable feedback on your natural approach to completing tasks and interacting with others. Strategies for Creating a Positive Relationship - This report describes how to establish a relationship with the respondent that is based upon trust and mutual respect. Relating to People and the Environment - This report explains how the respondent interacts with peers and interprets his or her environment. Strategies for Managing - This report looks at ways in which people can most effectively manage the respondent. 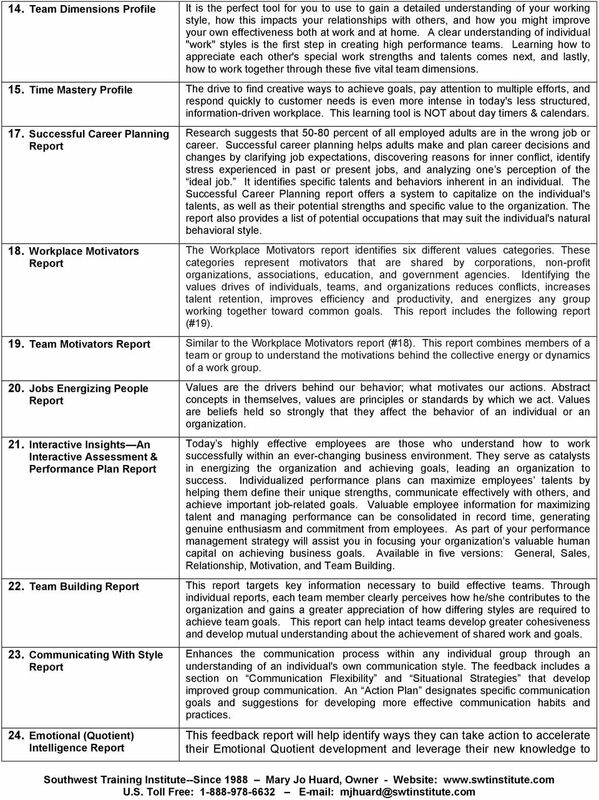 Approach to Managing Others - This report analyzes the respondent's management style and behavior toward subordinates. Strategies for Sales Management - This report examines the methods that people can best use to manage the respondent in a sales environment. Approach to Selling - This report describes how the respondent performs essential steps in the sales process. 42. Management Action Planner Apply DiSC to effective situational management practices. Become a better manager with this action-oriented planning tool that bridges behavioral styles and situational leadership theory. Develop management strategies to meet diverse needs. 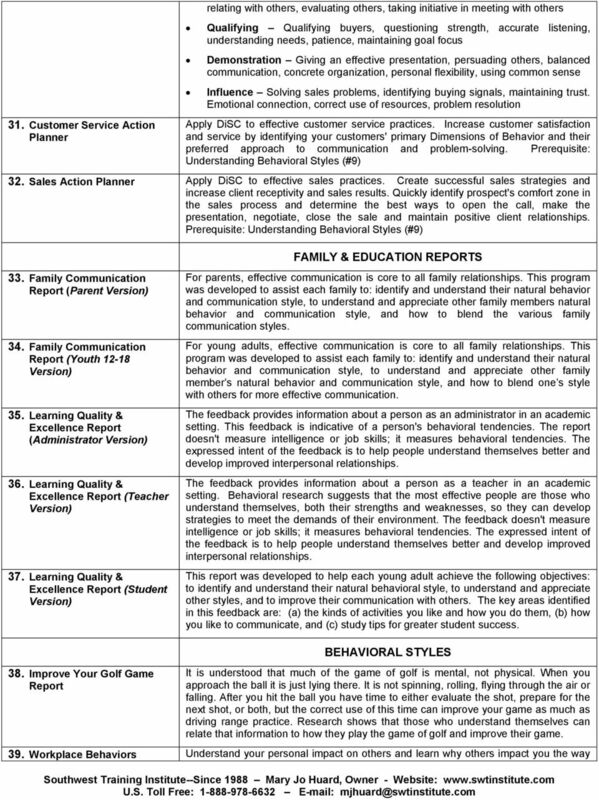 Prerequisite: Understanding Behavioral Styles (#9) 43. Managing Performance Action Planner 44. Personality Styles (DiSC Classic) 45. 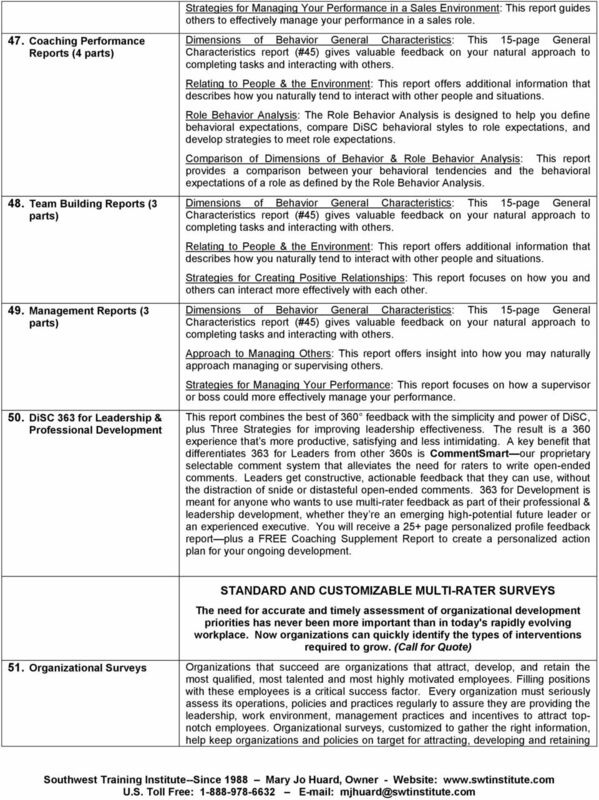 General Characteristics Behavioral 46. 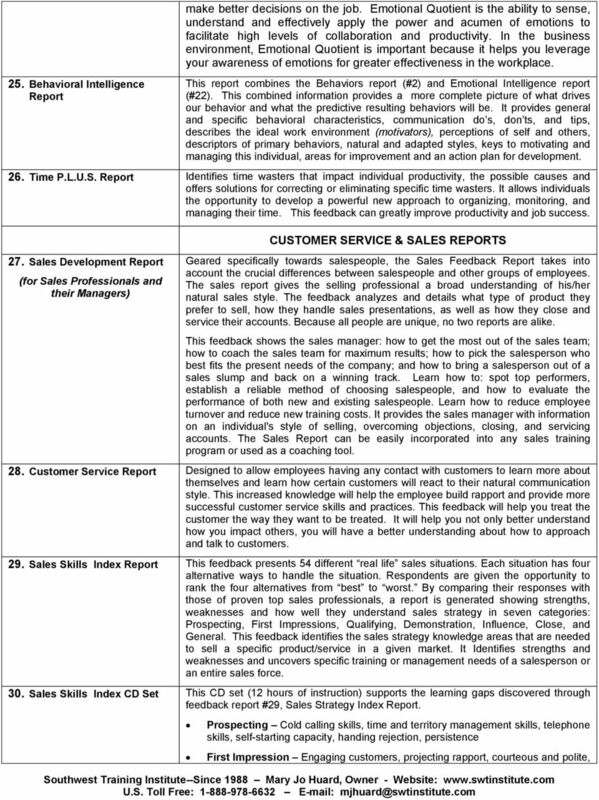 Sales Behavior s (3 parts) Apply DiSC to effective management of people, process, and performance practices. Develop effective ways to manage, coach and lead others with Dimensions of Behavior. Assess strengths and motivation, then plan and implement strategies that encourage productivity. A practical tool for managers and supervisors at all levels. Prerequisite: Understanding Behavioral Styles (#9) Enhances the communication process within any individual group through an understanding of an individual's own DiSC communication style. The feedback includes a section on Communication Flexibility and Situational Strategies that develop improved group communication. An Action Plan designates specific communication goals and suggestions for developing more effective communication habits and practices. This General Characteristics Behavioral gives valuable feedback on a person's natural approach to completing tasks and interacting with others. This 15-page report will give you an extensive, personalized narrative interpretation of your DiSC behavioral tendencies in a particular environment. It helps employees at all levels better understand their own behavior, learn how and when to adapt their behavior, improve communication and reduce conflict, and enhance individual and team performance. 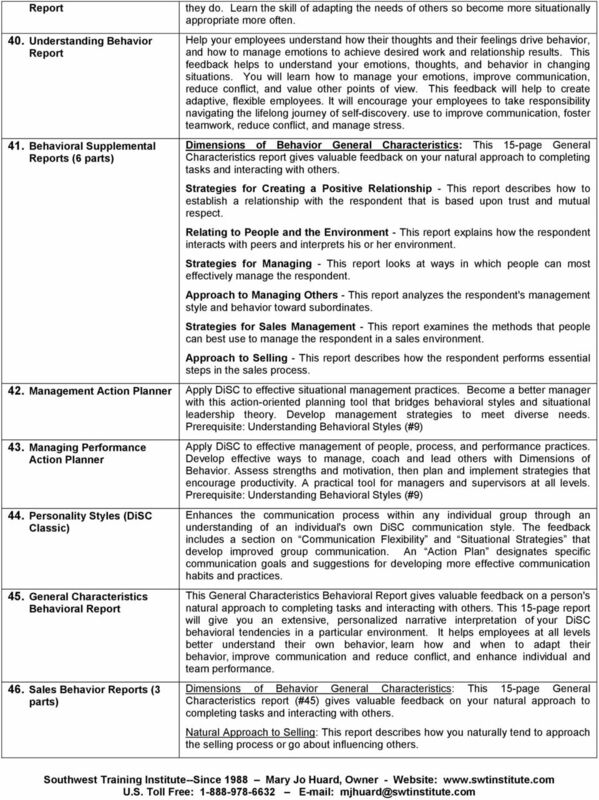 Characteristics report (#45) gives valuable feedback on your natural approach to completing tasks and interacting with others. Natural Approach to Selling: This report describes how you naturally tend to approach the selling process or go about influencing others. 9 the best employees Degree Personalized Feedback Personal effectiveness within each key position is crucial to the ongoing success of the organization. Multi-rater surveys, or 360 surveys, allow multiple team members, coworkers and/or managers to give valuable feedback regarding the effectiveness of an individual s performance. The results of 360 surveys are used to enhance and develop the interpersonal skills and effectiveness of employees. Multi-rater surveys have become standard in successful organizations. 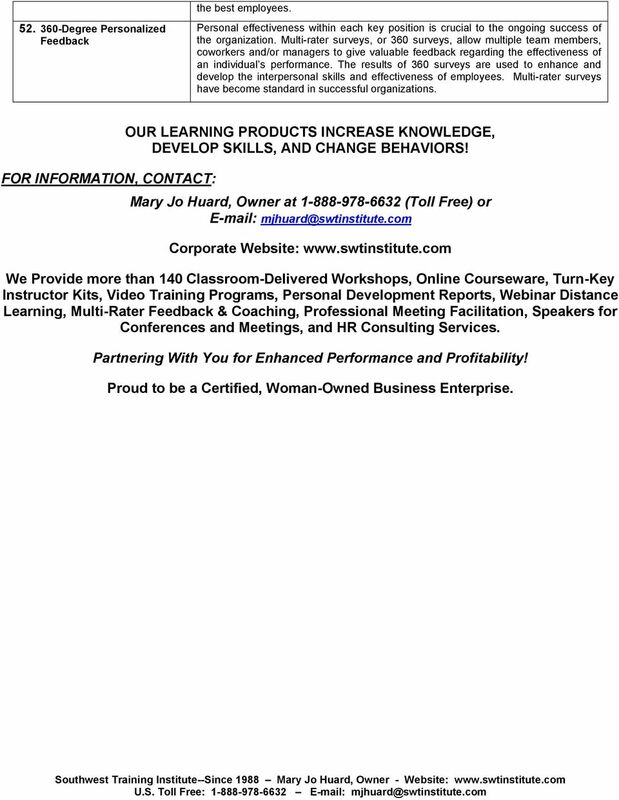 FOR INFORMATION, CONTACT: OUR LEARNING PRODUCTS INCREASE KNOWLEDGE, DEVELOP SKILLS, AND CHANGE BEHAVIORS! Mary Jo Huard, Owner at (Toll Free) or Corporate Website: We Provide more than 140 Classroom-Delivered Workshops, Online Courseware, Turn-Key Instructor Kits, Video Training Programs, Personal Development s, Webinar Distance Learning, Multi-Rater Feedback & Coaching, Professional Meeting Facilitation, Speakers for Conferences and Meetings, and HR Consulting Services. Partnering With You for Enhanced Performance and Profitability! Proud to be a Certified, Woman-Owned Business Enterprise. Copyright 2004.Pamela Cole. All rights reserved. Q: What is Executive Coaching? Q: What happens in an executive coaching session? Q: How does Executive Coaching Take Place? Sales Concepts one-to-one approach to training means that our programs are tailored for the individual, not just the industry or company. People Management and Leadership Training That Gets Results! www.apm.co.th About APMGroup A trusted business partner to South East Asia s leading organizations, we provide strategic management and leadership development solutions for Private and Governmental organizations.